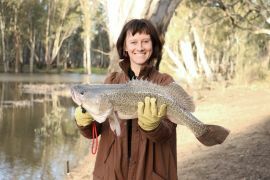 It was the fifth Murray cod we had caught over the weekend, and our second around 75cm long. After we took the photo and put it back in, Dad said: "There are many more Murray cod in these rivers than there were in the 1970s. Someone's doing something right." Many people are doing many things right. Though native fish in the Murray-Darling Basin have declined by up to 90% since Europeans arrived, river goers have been working hard over the last 50 years to bring them back. Since the 1970s, proactive communities and governments have stocked our rivers with native fish, improved fish habitat by revegetating river banks and putting snags back into the river, attempted to manage carp, installed fishways on dams and weirs to allow fish to move up and down stream, and delivered environmental water. "Flow, habitat and connectivity" write fish biologists Brendan Zampatti and Martin Mallen-Cooper in the latest edition of RipRap. "These are the three key elements." As anglers know native fish have different flow preferences. Murray cod like many different flows but when breeding they like snags in flowing water so they can use them to lay their sticky eggs while gobbling food from the water that flows past. The silver perch is consistently reported to enjoy faster flows. The now rare freshwater catfish generally prefers slow-moving water. Golden perch like flowing water with occasional flow pulses (preferably in winter-spring) to trigger spawning and dispersal of their eggs. All the little critters and bugs that large-bodied native fish eat also have different flow preferences. Tadpole shrimp (see photo below) tend to live in still, shallow pools, often off the main stem of the river. Simuliid larvae (very small, pear-shaped fly larvae) attach themselves to rocks in fast-flowing water. Glass shrimp and water boatman (swimming beetles) prefer slow-moving water amongst vegetation on the side of the river channel. 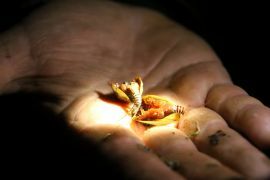 Yabbies tend to live away from the main flow, on the bottom and sides of the river. The different flow preferences of native fish – and the critters, bugs and vegetation that support native fish – have developed over thousands of years in rivers and wetlands in which flow varied a lot. This is why people talk about Australian ecosystems being 'boom and bust' – and everything in between. This high and natural flow variability created diverse river and wetland ecosystems characterised by complex habitats and food chains. Since we started building dams and weirs on a large scale to supply water to towns, industry and agriculture, river flows have changed. Flows are more controlled, and consistent. Once-connected rivers that used to be full of hundreds of riffle and pool habitats are now made up of disconnected lake-like habitats punctuated by dams and weirs. Many native plant and animal species, including native fish, no longer get the flows they require to feed, mature, migrate and spawn. These changes have contributed to the large-scale decline in native fish. Environmental watering re-introduces some of the river flows – and foods and habitats – that our native fish depend on. Environmental watering means flows released from dams and controlled through weirs, channels and pumps to put back some of the natural flow variability in rivers and wetlands. Though environmental water can mean any water in a river or wetland that benefits the environment, here we are referring to water that's set aside in dams and reservoirs, or pumped from a river to a wetland, and intentionally delivered for plants and animals, including native fish. Many people believe that just adding water does the trick. However, timing is equally, if not more, critical. Environmental water is delivered at times of year that plants or animals have evolved to prefer. Since the development of dams and weirs to supply water to towns and farms in summer, rivers that were naturally low in summer are now high in summer, and vice versa. Environmental water managers try to 'correct' this to some degree and return some of the small- and medium-sized flows back to rivers and wetlands at the right times of year – to mimic in some way what nature would have done. Environmental water can be delivered to 28 of the top 50 fishing spots in Victoria. This year, all 28 of these fishing spots will receive water – either natural flows or managed environmental water. Across Victoria, the popular native angling species that environmental water targets each year are black bream, Macquarie perch, estuary perch, silver perch, golden perch, freshwater catfish and Murray cod. In 2015, environmental water helped to connect disconnected parts of the drying Glenelg River, allowing individual estuary perch and tupong to travel 330 kilometres. Environmental water in Gunbower Creek through most of the year resulted in recordings of Murray cod of mixed ages, and facilitated successful cod nesting and breeding. Environmental water has kept the Wimmera River running across successive dry years and has maintained habitat for native plants and animals including one particular fish – a large golden perch affectionately known as 'Spotted Bess' – which has been caught many years in a row. The research and monitoring that supports environmental watering is world class. There is an increasing body of evidence that what we are doing is working, in combination with the other important ingredients that Brendan and Martin wrote about in the last edition of RipRap: improving habitat and connectivity. Each year, we continue to see fantastic outcomes for native fish, plants and animals across Victoria. These days, Dad and I are catching many more Murray cod on our favourite river bend. Someone's doing something right. By Emma Coats from the VEWH. First published in Fishing Lines.